Green Bay Phoenix senior guard Keifer Sykes drew high grades in the opening round of the NCAA Slam Dunk competition at Hinkle Fieldhouse in Indianapolis on Thursday night, then moved past the semifinals. The shortest player in the competition now had the attention of the judges as he faced Delta State’s LaQuavius Cotton in the final round. But Sykes missed all four of his dunk attempts in the final round to finish second in the Dunk Competition. Marquette’s Matt Carlino wasn’t happy when the PA Announcer forgot to announce him along with the other 3-point participants. Carlino went on to score just 13 points in the opening round, falling to Butler’s Alex Barlow, and making a quick exit from the three-point competition. Gonzaga’s Kevin Pangos won the mens competition but then bowed out when Portland’s Cassandra Brown (women’s champion) pulled out a 22-21 victory in a man vs. women battle of the champions. Green Bay Phoenix senior point guard Keifer Sykes was named an honorable mention selection for the Associated Press 2014-15 All-America Team. Sykes joins Tony Bennett as the only players in program history to earn the distinction in two seasons. It’s the second time Sykes has received All-America honorable mention honors. During his career in Green Bay, Sykes scored 2,096 points and added 526 assists, 467 rebounds and 155 steals. He ranks second on Green Bay’s all-time scoring list. On Thursday, Sykes will compete in the State Farm College Slam Dunk Championship in Indianapolis at 6 p.m. CST. The dunk contest will be televised live nationally by ESPN. The Green Bay Phoenix saw their season come to an end in the opening round of the NIT on Wednesday night, falling to Illinois State 69-56. The Phoenix (24-9) led 31-24 at halftime, but the Redbirds (22-12) used a 10-0 run late to pull away for the victory. Green Bay missed 8 of its final 10 shots from the field and hit just 6 of 13 at the free throw line. The Redbirds went 27 for 33 at the free throw line. Illinois State put four players in double figures, led by a career high 18 points from sophomore guard Paris Lee. Senior guard Daishon Knight added 17 points and sophomore center Reggie Lynch had 15. The Phoenix had two players in double figures. Senior point guard Keifer Sykes finished with 14 points in his last game in a Green Bay uniform. Senior forward Alfonzo McKinnie added 11. 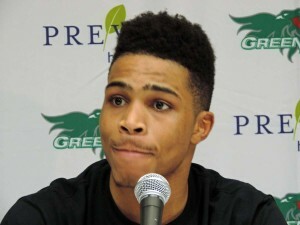 The Green Bay Phoenix men’s basketball team hasn’t reached the NCAA Tournament since 1996. But they did land a spot in the NIT field for the second straight season. Green Bay landed a spot in the 32-team NIT field last night. The Phoenix (32-8) will play at Illinois State at 7 p.m. on Wednesday night (ESPNU). Green Bay entered the season as the preseason favorite in the Horizon League, picked to repeat as regular season champions. But the Phoenix had to settle for second, behind Valparaiso. The Crusaders also won the Horizon League Tournament title, coming from behind to beat Green Bay. 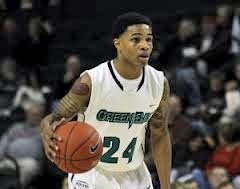 Green Bay posted a second straight 20-win season, behind point guard Keifer Sykes (18.9 ppg, 4 rpg and 4.1 assists). But when it came to support around Sykes, it was hit and miss. The Phoenix finished 333rd in three-point shooting (29.8%) out of 351 D-1 schools. Free throw shooting (64.6%) also hurt the Phoenix. they finished 324th nationally in that category. Green Bay lost to Belmont 80-65 in last seasons NIT opener. The Green Bay Phoenix took a 39-31 lead over Valparaiso with 11:43 to play in the Horizon League Championship game. Things went cold from there. Green Bay made just 1 of 14 shots from the field to end the game and fell to the Crusaders 54-44. Green Bay (24-8) was playing in the championship game of the conference tournament for the first time in 17 years. But this was a winner take all game. The winner would get the automatic bid to the NCAA Tournament and the loser will have to settle for something less. Green Bay’s NCAA Tournament dry spell will now reach 19 years. Keifer Sykes scored 14 points, but no other Green Bay player would reach double figures as the Phoenix fell to 0-6 over the last four seasons in games played at Valparaiso. The Green Bay Phoenix men’s basketball team faces Valparaiso in tonight’s Horizon League Championship game (6 p.m. tip). The Phoenix are playing in the title game for the first time in 17 years. Green Bay has won 48 games in the past two seasons, just one shy of the schools Division 1 program record. Green Bay Phoenix senior guard Keifer Sykes is the Horizon League Player of the Year for the second-straight season. Sykes becomes the first player since Detroit’s Rashad Phillips in 2000-01 to win back-to-back player of the year awards and the fifth player in the league’s history to win player of the year two or more times. Sykes joins Tony Bennett (1990-91, 1991-92) as the only players in Green Bay’s Division 1 history to be named the conference player of the year twice. The Horizon League will announce its player and coach of the year awards, along with all of the other league honors this afternoon. In advance of that announcement, the Horizon League named Preseason Player of the Year Keifer Sykes the Player of the Week for a record 13th time in his career. Green Bay senior guard Keifer Sykes shoots for 2,000 career points tonight when the Phoenix face Illinois-Chicago in Horizon League action. Sykes is one of four seniors on the Green Bay roster that hail from the Windy City (Greg Mays, Alfonzo McKinnie and Josh Humphrey the others) and will be playing their final collegiate game in their hometown.